Occasionally summons a tornado that picks him up and whirls about. The achievement that rewards this pet requires players to collect all 10 pets that drop from three Burning Crusade raids. The bosses can be found within Karazhan, Tempest Keep, and Serpentshrine Cavern. The animation for this pet has made it one of my favorite pets. A tornado swoops down once in awhile, it may be carrying a house, cows, trees, etc. I just love it. Of course he's supposed to be Toto he's from Karazhan. Karazhan has an opera event. Oz, starring Dorothee and her dog Tito, is one of the plays. I'm surprised that no one has made a connection to The Wizard of Oz and Toto here? He gets his own Tornado and everything. :) I think that Toto also gets a red bowtie at the end of the movie when they get to Oz and all get their "make-overs". He also gets carried around by Dorothy in a basket, just like he gets delivered to you when you complete the achievement! I just got him, so no idea how he is in battle, but I love his looks. I'm a fan of the red worgs in the game, both my Horde and Ally hunters have one, so he'll be a cute companion. Now I need a red Riding Worg. A bit lowish health and no crouch. Still interesting with Cyclone and Howl. I'm not a fan of Triple Snap, much too random. Ultimately fun with something different and can be useful, but powerful? Not really. Still both good power and speed in an unusual distribution. And a bowtie! I love worgs, so I'm actually a pretty big fan of Tito (That, and he looks like my dog). I also like that his howl when summoned is slightly higher pitched than Moon Moons summon howl. The bow is cute, but I wish they'd but it on the back of his neck so it's more visible. It just looks weird underneath. Overall, I'm really happy with this pet. It looks like the other Worg, The Bow/Tie is barely visible and the Attacks are...average. Mr.Bigglesworth is a much superior reward, and considering that the Drop Rate seems to be lower it's just..wrong. Edit: During combat the Bow/Tie seems to be missing. I think his tornado animation is HILARIOUS! I love the cows. I bet it's a tribute to the movie "Twister" when Helen Hunt's character yells out, "COW!...ANOTHER COW!" as a tornado sweeps across a lake carrying a lovely Holstein with it. ahaha! I love this pet. I had no idea about the tornado and I had my plates showing (ctrl+v) and all of a sudden two cows buzzed past me. Made my day. The pink bow makes me sad - it's more like a deformed blob that peeks out from under his chin. It looks more like a doggie "Columbian neck tie," but with careful camera turning and zooming in, I was able to understand (because someone here identified it) that's supposed to be (but imho epically fails to be) a bow. Blizz couldn't manage better than that? He'd be better off without the bow, frankly. On the plus side, Tito sits and howls up at the sky when you summon him which I find super cute. The tornado (complete with Dorothy's house) that spits him up in the air is hysterical, although it seems very infrequent. Unlike what he appears to look like on the picture and preview in the pet journal, Tito has an adorable pink bow tie around his neck, which is most visible the moment he is summoned, when he howls. You guys complaining must have never actually done Karazhan when it was current content. Tito looks exactly as he did back then, and I wouldn't have it any other way. Let Tito follow you around long enough and a twister, complete with cows sucked up into the vortex, will spawn and lift Tito into the air. Gotta say that Blizzard got lazy again. 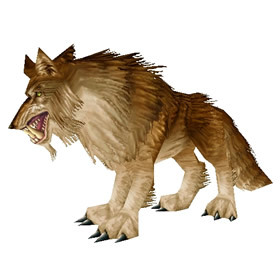 An original grphic would have been nice not just the old worg/wolf one. Another actual dog design would have been awesome. Hrm.. Tito seems fairly weak. Though generally an expert at taking stage direction, the show had to be stopped on more than one occasion when Tito and Roar would lock eyes, resulting in an extended chase around the Karazhan Opera House.